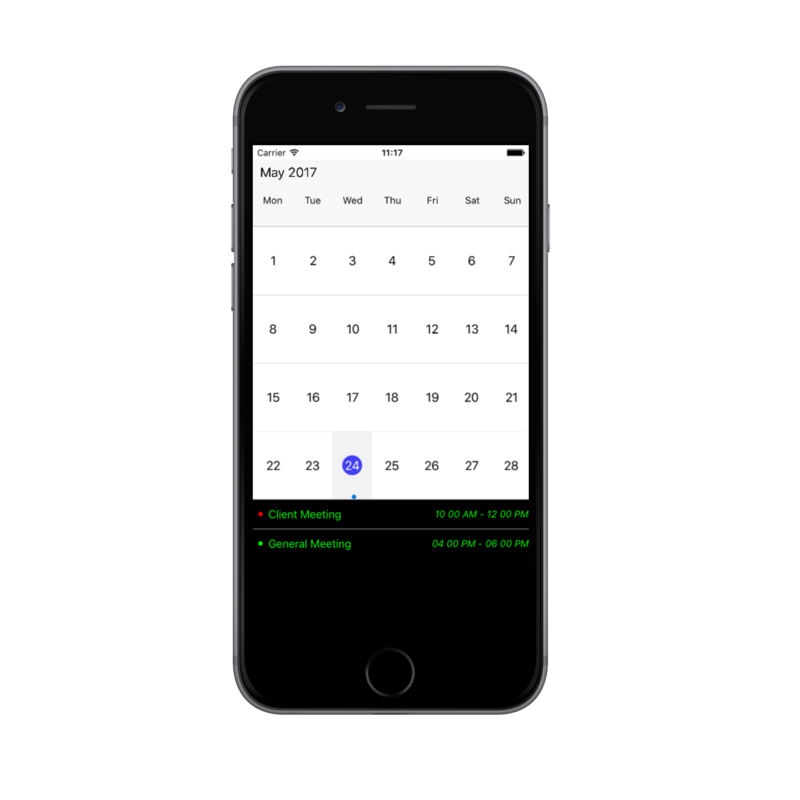 MonthView of SfSchedule used to display entire dates of the specific month, current month will be displayed by default initially. Current date color is differentiated with other dates of the current month, also the color differentiation for dates will be applicable for previous and next month dates. In MonthView, appointments are not viewed in the month cell instead appointment indicators are drawn. 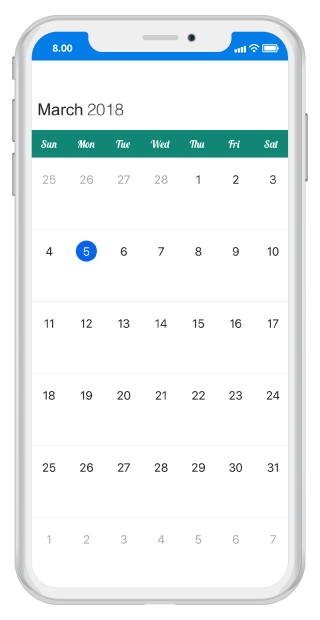 You can customize the number of appointment indicators displayed in month cell using AppointmentIndicatorCount property of MonthViewSettings in SfSchedule, by default Appointment indicator count is 3. 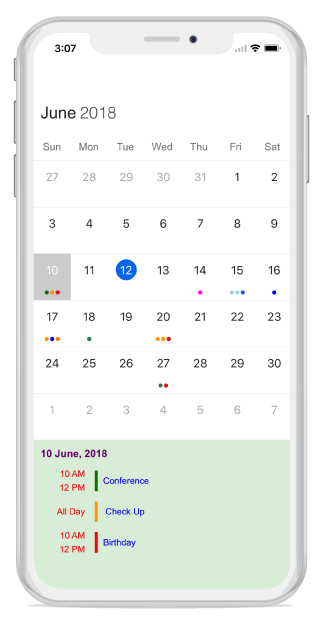 If appointments count are lesser than the AppointmentIndicatorCount value in the particular day, then according to number of appointments available, indicator will be displayed in the month cell.Maximum number of appointment indicators drawn in the month cell is 6. You can use ShowAppointmentsInline bool property in MonthViewSettings to enable / disable the month inline view, by setting ShowAppointmentsInline property as true you can view the Appointments in the specific date. 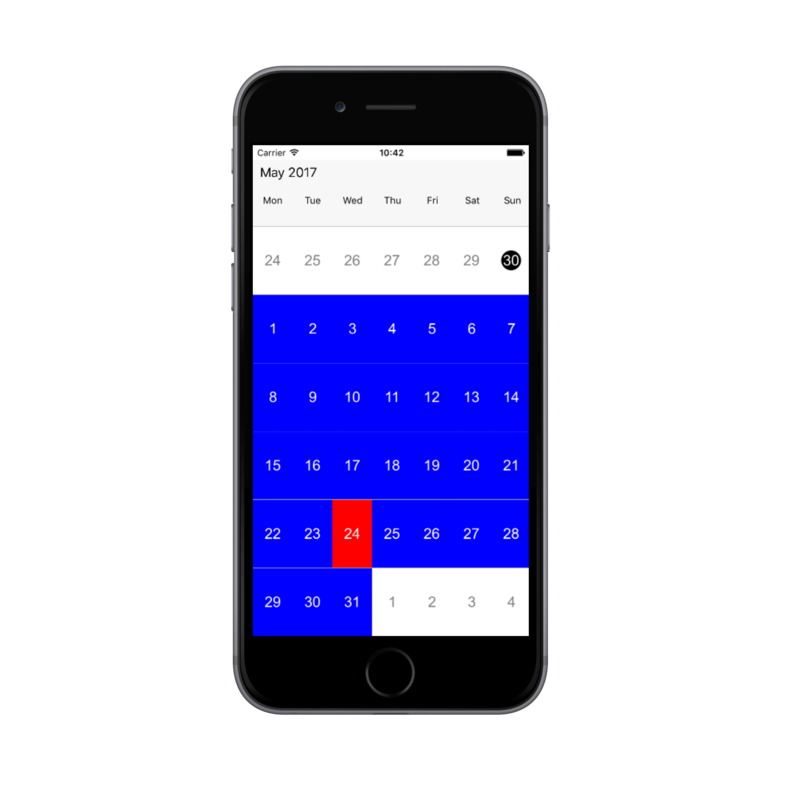 The Schedule month view displays a divided agenda view which is used to show the selected date’s appointments below the month. You can show agenda view by setting ShowAgendaView property as true. 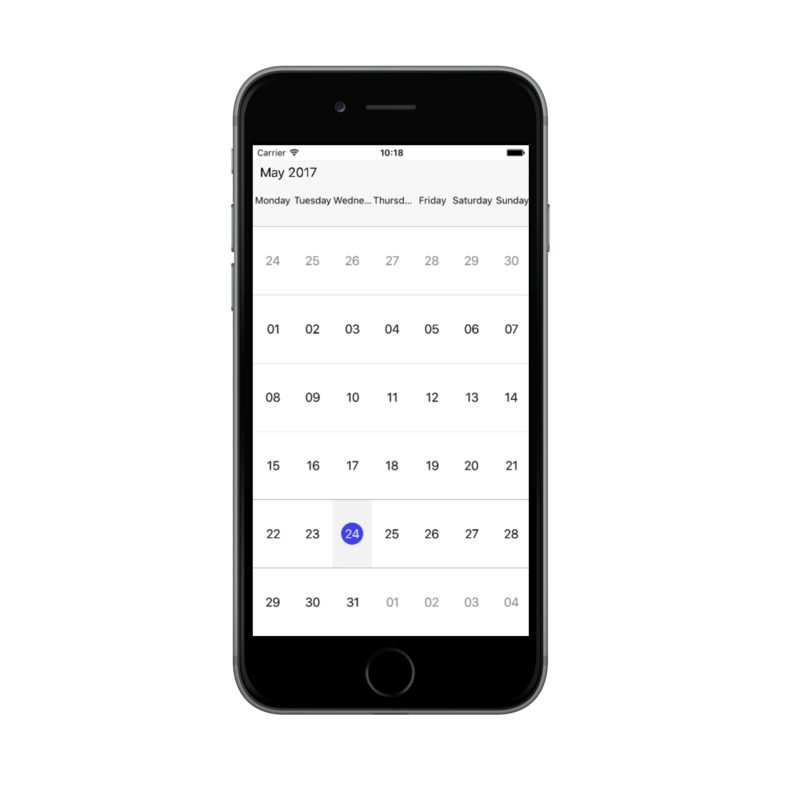 An agenda view displays text as “No Selected Date” until no date is selected. If there is no appointment in a selected day, agenda view displays the text as “No Events”. If you enable ShowAgendaView and ShowAppointmentsInline properties together, both of the views (Agenda View and Appointment Inline View) will be displayed in schedule month view. 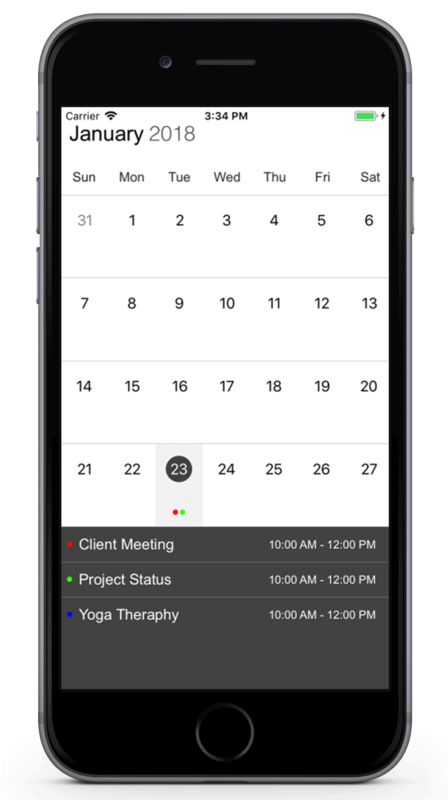 You can customize the Agenda view appointment and Selected Date Text by setting AgendaViewStyle property of MonthViewSettings. 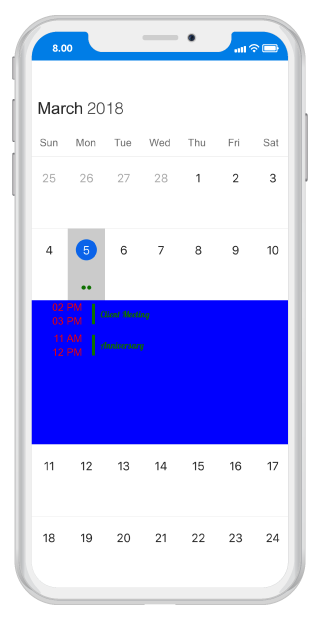 Agenda view DateTextColor , HeaderHeight , DateTextFormat , DateTextStyle , TimeTextColor , TimeTextStyle , TimeTextFormat , SubjectTextColor , SubjectTextStyle , SubjectTextSize , BackgroundColor can be customized using AgendaViewStyle properties. 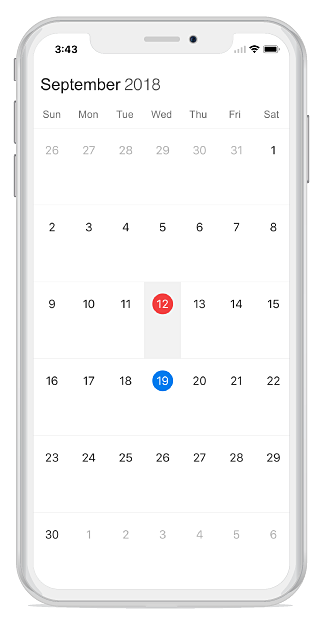 MonthView of Schedule can be navigated in both horizontal and vertical direction. 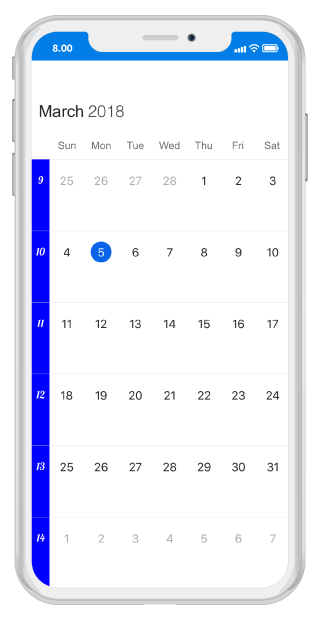 You can change the direction of navigation through MonthNavigationDirection property of MonthViewSettings in SfSchedule, by default Month navigation direction is Horizontal. 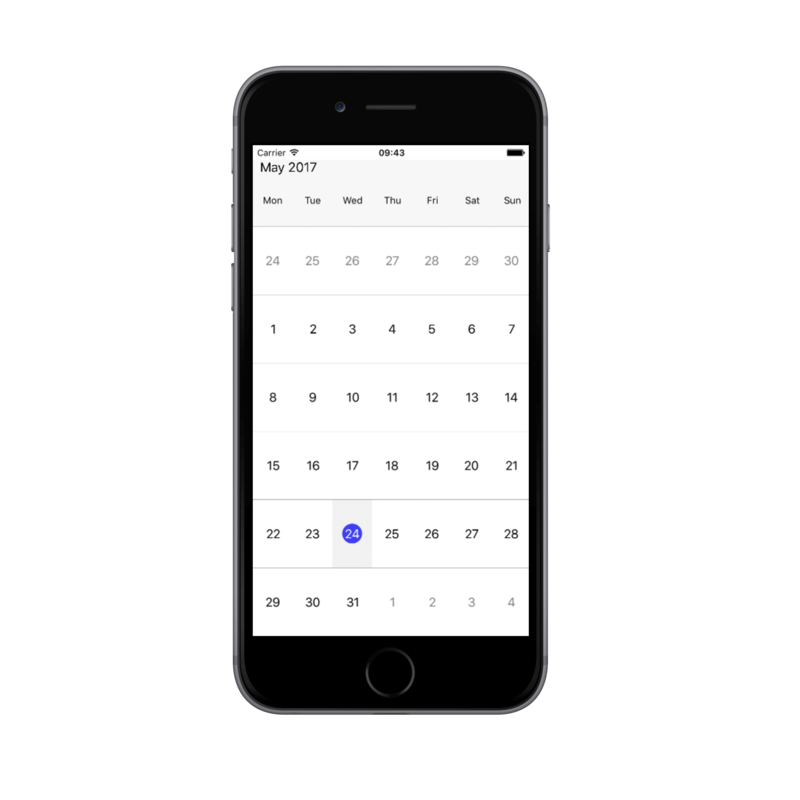 You can disable the interaction for certain date in Month view by using BlackoutDates of MonthViewSettings, using this you can allocate / restrict the specific date for predefined events. You can set First day of week using FirstDayOfWeek property of SfSchedule, by default schedule control will rendered with Sunday as the first day of the week. You can display the Week Number of the year in Month View by setting ShowWeekNumber property of MonthViewSettings as true, by default it is false. 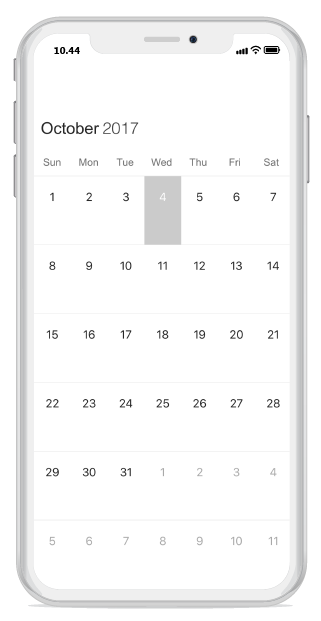 You can customize the Week Number appearance by using SFWeekNumberStyle property of MonthViewSettings. Week number BackgroundColor, TextColor and TextStyle can be customized using SFWeekNumberStyle properties. You can change the Format of the Month date and day labels string in the Schedule using DateLabelFormat, DayLabelFormat and DateLabelSize properties of LabelSettings in MonthViewSettings. 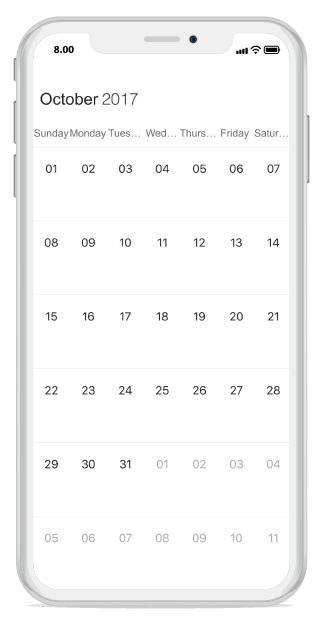 You can customize the View Header appearance by using SFViewHeaderStyle property in SfSchedule. View Header BackgroundColor, DayTextColor and DayTextStyle can be customized using SFViewHeaderStyle properties. You can customize the date and day format of SFSchedule ViewHeader by using DateLabelFormat and DayLabelFormat properties of LabelSettings. 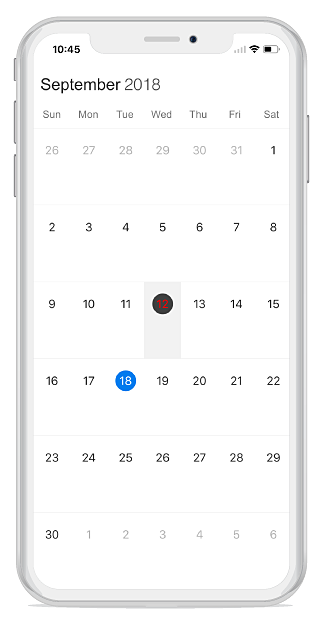 You can handle single tap action of ViewHeader by using ViewHeaderTapped event of SFSchedule. This event will be triggered when the ViewHeader is Tapped. This event contains ViewHeaderTappedEventArgs argument which holds Date details in it. 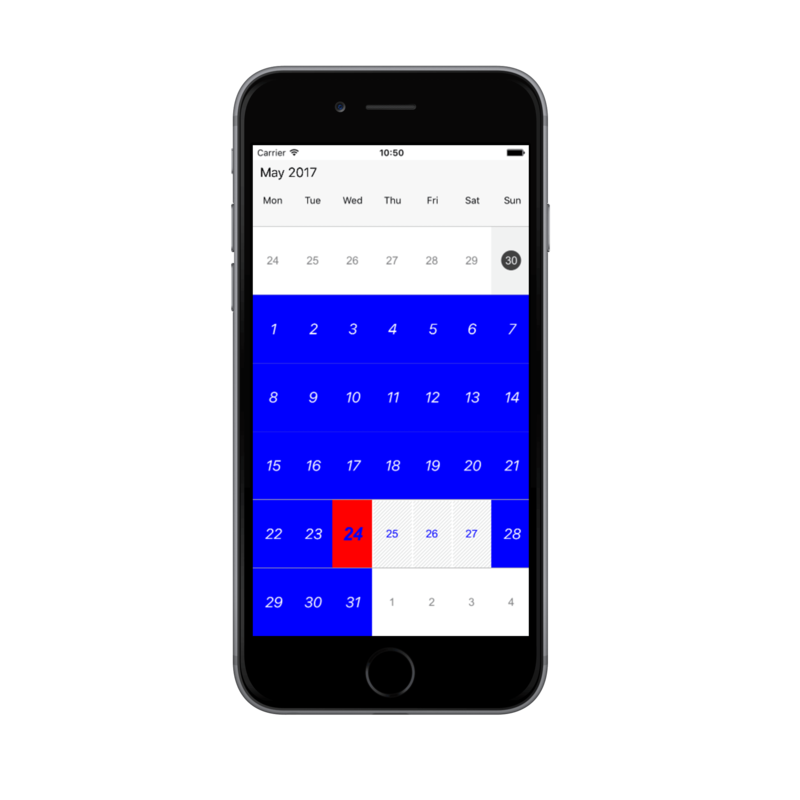 By using SFMonthCellStyle of SfSchedule you can customize the month cell properties such as BackgroundColor, NextMonthBackgroundColor, NextMonthTextColor, PreviousMonthBackgroundColor, PreviousMonthTextColor, TextColor, TextStyle, TodayBackgroundColor and TodayTextColor. 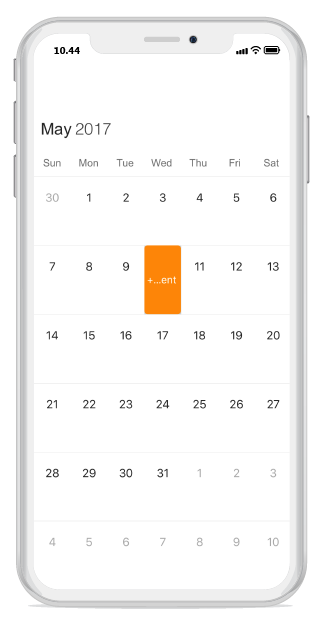 By using MonthCellLoaded event in SfSchedule, you can customize the month cell properties in the run time. 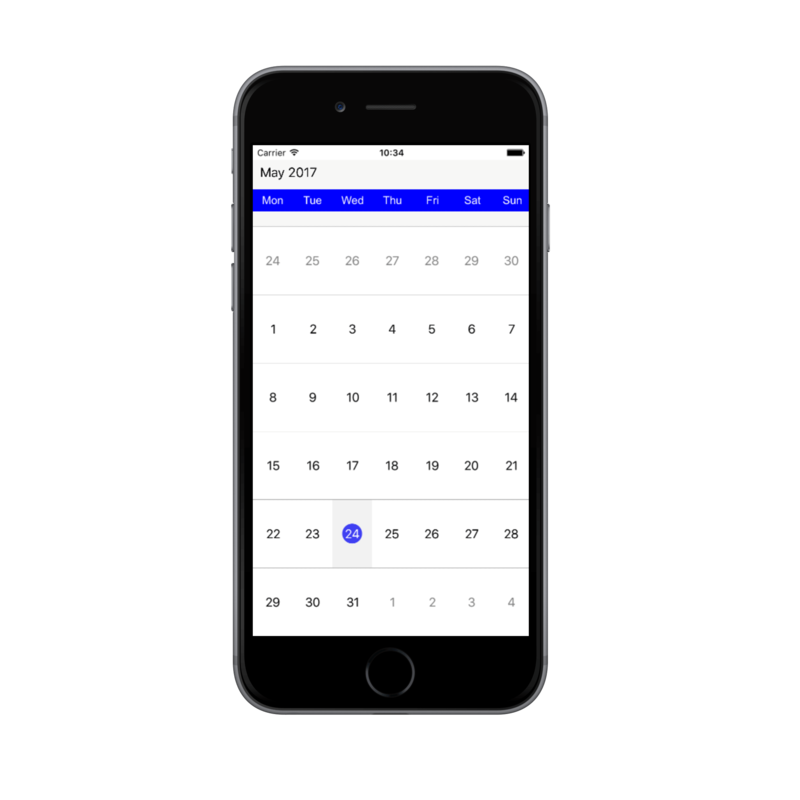 In MonthCellLoaded event, arguments such as CellStyle, Appointments, Date, View and boolean properties such as IsToday, IsNextMonthDate, IsPreviousMonthDate and IsBlackOutDate are in the MonthCellLoadedEventArgs. You can set the Custom UI for the month cell using View property of MonthCellLoadedEventArgs in the MonthCellLoaded event of SfSchedule. Using Appointment argument in the MonthInlineAppointmentTappedEventArgs of MonthInlineAppointmentTapped event, you can get the details Month Inline Appointments details while tapping the specific appointment. 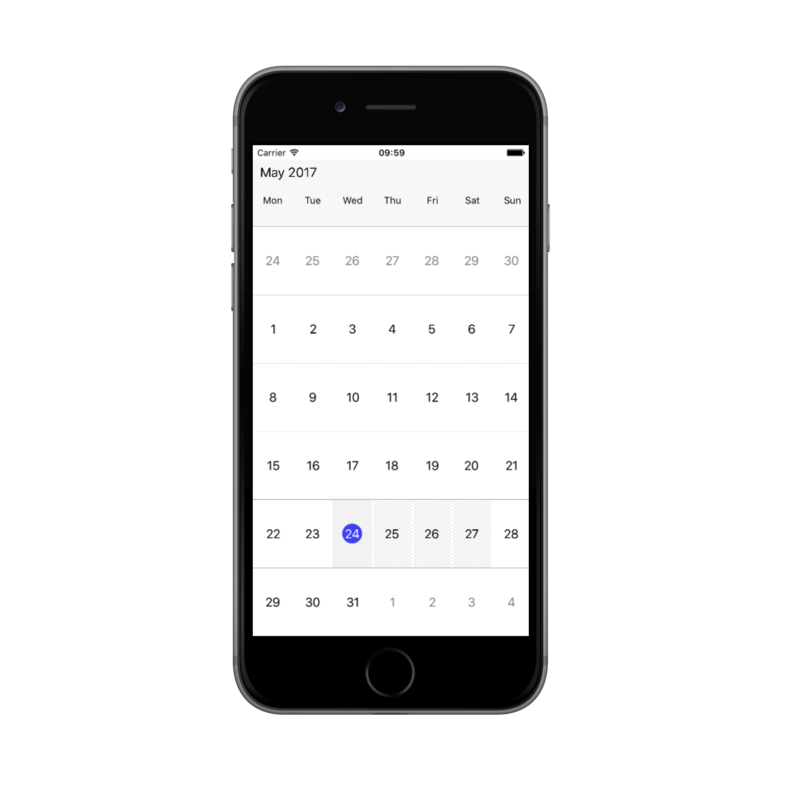 You can do the required functions while tapping the inline appointment using this event. By using MonthInlineLoaded in SfSchedule, you can customize the month inline view properties in the run time. In MonthInlineLoadedEvent, arguments such as MonthInlineViewStyle, Appointments and Date are in the MonthInlineLoadedEventArgs. You can customize the Month inline view Appointment by using MonthInlineAppointmentLoaded event in SfSchedule, using View of MonthInlineAppointmentLoadedEventArgs argument. 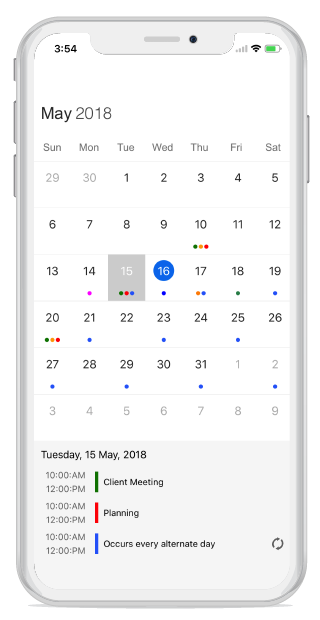 You can get the details of Appointment in the Appointment argument. You can customize the default appearance of selection UI in the month cells. 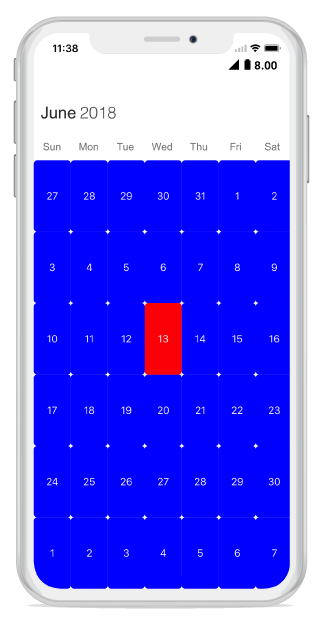 Month cell Selection Text Color can be customized using SelectionTextColor property of MonthViewSettings. Month cell Selection Indicator Color can be customized using SelectionIndicatorColor property of MonthViewSettings. 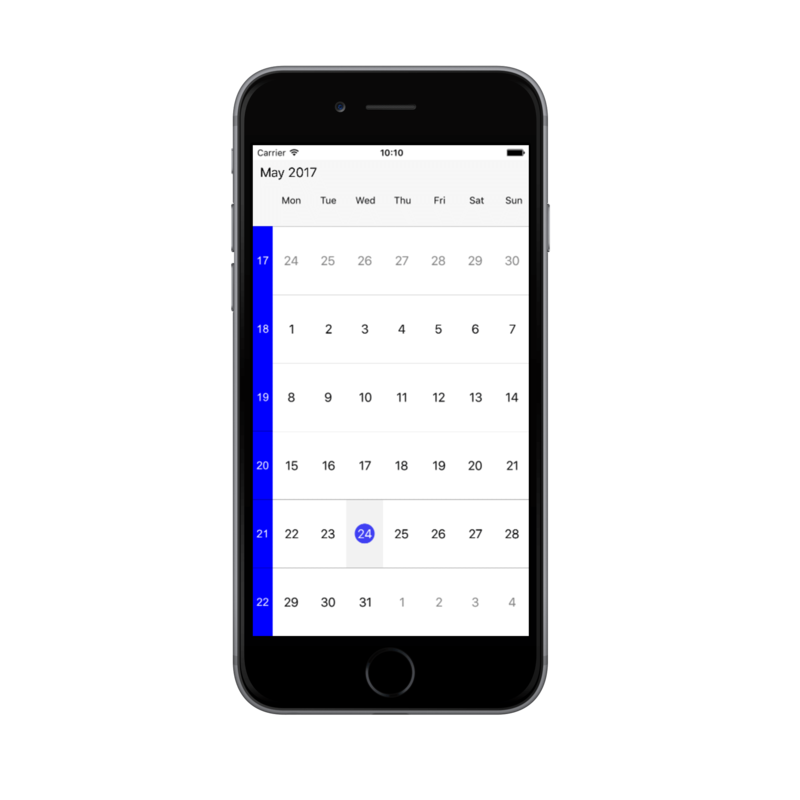 This support won’t apply for current day indicator, you can use TodayBackgroundColor property to customize the same. 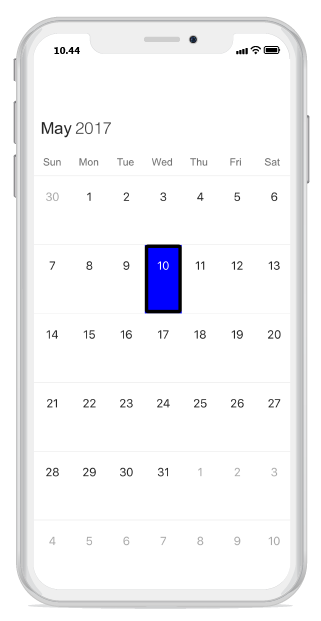 You can customize the month cell selection by using SelectionStyle property of SFSchedule. You can programmatically select the specific cell by setting corresponding date to SelectedDate property of SFSchedule. By default, it is null. 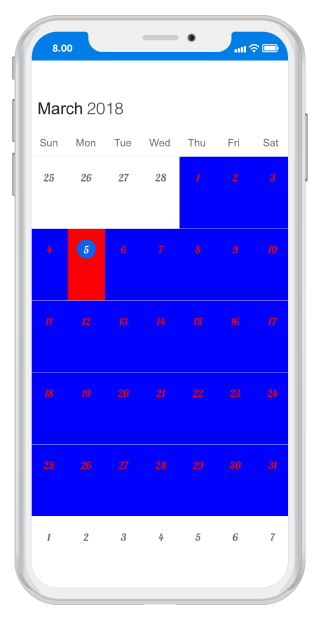 You can customize the current date background of SFSchedule by using TodayBackgroundColor property of MonthViewSettings. You can change the appearance of Font by setting the TextStyle property of following classes. 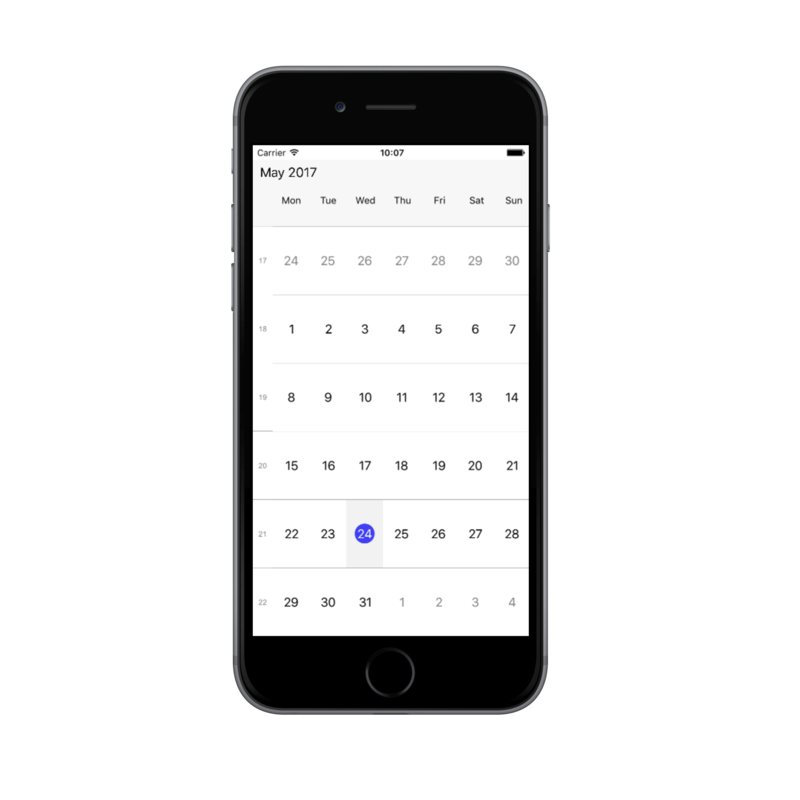 ViewHeaderStyle- You can change the appearance of ViewHeaderStyle by setting the DayTextStyle and DateTextStyle properties of Schedule ViewHeaderStyle. 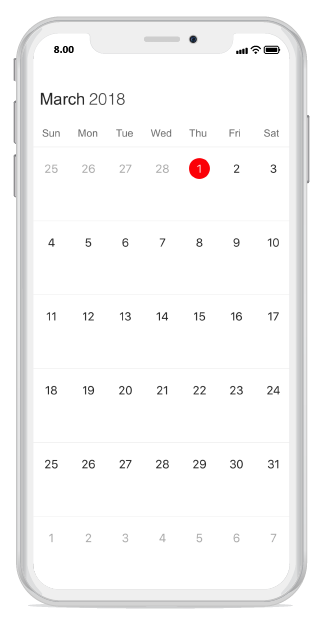 MonthCellStyle - You can change the appearance of MonthCellStyle by setting the TextStyle property of Schedule MonthCellStyle. MonthInlineViewStyle - You can change the appearance of MonthInlineViewStyle by setting the TextStyle property of Schedule MonthInlineViewStyle. WeekNumberStyle - You can change the appearance of WeekNumberStyle by setting the TextStyle property of Schedule WeekNumberStyle. Following steps will explain how to configure the custom fonts. Add the Custom Font (e.g. Lobster-Regular.ttf) to the Resources Folder. Edit info.plist and add a key Fonts provided by application (value type should be Array). In item0 of the array enter the name of the Font you added in the Resource folder (Such as Lobster-Regular.ttf). Then, directly use Custom Font name as TextStyle. No need to mention .ttf when set the Custom Font in iOS.